The Department of Trade and Industry (DTI) led by its Undersecretary for Trade and Investments Promotion Group (TIPG) Nora K. Terrado, is all set to showcase the different sectors of the Philippine creative industry in a bid to advance Filipino creativity as one of the key drivers for economic growth. “As a country, we want to take part in making creativity a key component for economic prosperity by intensively advocating and promoting its role in the future of the ASEAN economic community,” said Terrado, who also chairs this year’s ASEAN Committee on Business and Investments Promotion (CBIP) under the ASEAN National Organzing Council (NOC). 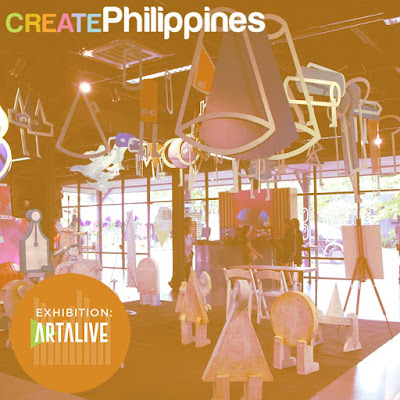 DTI, through the Center for International Trade Expositions and Missions (CITEM), is set to take advantage of the multi-billion industry through CREATE Philippines, the country’s first international creative industry trade event. Featuring the best and the brightest in the Philippine creative scene, CREATE Philippines will serve as a development platform where artists, professionals, content creators, and developers can showcase their work and vie for business opportunities. The trade event will run concurrent to the 66th edition of Manila FAME, the country’s premier lifestyle and design event, on October 20-22, 2017 at the Philippine Trade and Training Center and Hall ONE, Pasay City. 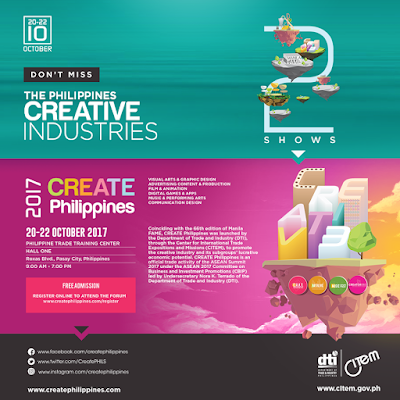 CREATE Philippines will serve as an idea hub, pitching event, masterclass venue, and trade fair, highlighting four high-potential creative sectors: advertising content and production, digital games and apps, film and animation, and performing arts. “[CREATE Philippines] will streamline the nation’s long-term goal of developing creative cities in the Philippines under the UNESCO creative cities network. It will accelerate the roadmap for the development of the country’s creative industry as we introduce the Creative Economy Council of the Philippines as the new generation of industry champions,” Terrado said. “The event will give a more unified voice to the industry through the collective participation of various agencies, members of public and private sectors, and other key stakeholders,” she added. The creative industry revolves around the production, promotion, distribution, and/or commercialization of goods services, and activities that are culture, artistic, and/or heritage-related in nature. These include sectors such as advertising, digital art/graphic design, animation, game development, film, and performing arts to catalyze the country’s presence in the global creative economy. In 2014, the industry employed 14.4% of the country’s total labor force and contributed to P661 billion pesos, 7.34% of the country’s total GDP. Worldwide, the creative industry is valued at $2,250 billion. Through its programs, DTI advances the promotion of the lucrative economic potential of the Philippines’ creative industries, creative clusters, and creative cities as a viable strategy for sustainable and inclusive development in the region.